This recipe has to be a Utah original. I had never heard of it until I moved here, and since then I have come across a variety of different versions. Some more spicy, some more sweet, some not so great, and some really delicious. I got this one from my Aunt Dana. So far it's one of the top two versions that are my favorite. If anyone knows who or where this recipe idea originated, I'd love to know the story. And if you've never heard of it or tried it, you should! 1. 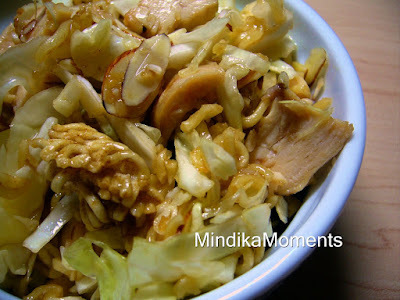 Mix shredded cabbage and chicken in a large mixing bowl. 2. In a separate bowl, mix together the butter and roman seasoning. Add the crushed roman and almonds and stir to coat. 3. Place the roman mixture on a baking sheet and cook at 350 for 15 minutes or until crunchy. Cool. 4. Add the crunchy roman to the cabbage and chicken. 5. Top with the dressing (recipe below) and stir to coat. 6. Chill for 1 hour before serving.